Charles Dickens needs no formal introduction, having been the most popular English writer of the 19th century and still one of the most popular writers in history today. Dickens upbringing was a mixture of happy times and sad: when he recalled his father being sent to debtors prison in his memoirs, his tears actually left marks on the page. Nevertheless, Dickens was obsessed with reading, making him a natural journalist by the age of 20, when he began a career in journalism. Along the way, he also began writing his own short stories and materials, often serializing them in monthly installments in publications, a popular method of publishing in the 19th century. 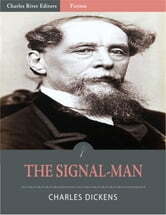 Unlike most writers, Dickens would not write an entire story before it began its serialization, allowing him to work on the fly and leave plot lines up in the air with each opportunity. By the time he died at the relatively young age of 58 from a stroke, he was already Europes most famous writer. His obituary noted that Dickens was a sympathizer with the poor, the suffering, and the oppressed. Dickens was interred in Westminster Abbey, a rare honor bestowed only among the greatest and most accomplished Britons. Many of Dickens novels were written with the concept of social reform in mind, and Dickens work was often praised for its realism, comic genius and unique personalities. At the same time, however, Dickens ability as a writer was nearly unrivaled, with his ability to write in prose unquestioned and unmatched. This edition of The Signal-Man is specially formatted with illustrations and a Table of Contents for easier navigation.